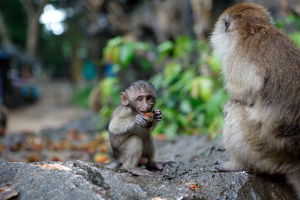 The young monkey turned away from his older brother and walked off toward the beach. Within seconds a Sea Eagle swooped down from high and plucked a crab just inches from the young monkey. He tossed his sweet potato high into the air and darted back toward the palm tree. Panting heavily he watched the potato for the next 20 minutes as the waves worked their way up the beach and eventually started gently rocking his sweet potato. The young monkey looked up into the sky and saw only the sun. He took a deep breath and bolted across the sand, into the mellow surf, snatched his sweet potato and bounded back to his older brother. Just then his older brother snatched his sweet potato and chomped off the top half. The next day, they walked down to the beach with their hands full of sweet potatoes and began dropping them in the waves. The elders of the troop LAUGHED and MADE FUN of the two brothers from under the palm trees day after day after day. Their laughs echoed across the water. Eventually, one by one, each of the troop elders joined them on the beach to wash sweet potatoes each morning. Once the 100th monkey from the troop started washing his sandy sweet potatoes in the water, as if by miracle, the monkeys from surrounding islands started washing their sandy sweet potatoes too. Culture Tip: Culture simply stated is “HOW WE DO THINGS AROUND HERE”. Corporate & Team culture is impacted by the BELIEFS & BEHAVIORS of the people you work with everyday. If people are saying one thing and behaving another… the BEHAVIORS win every time…. What advice do you have for the young monkey’s of the world?